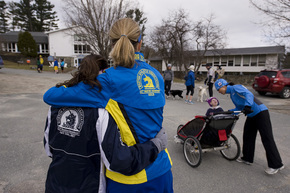 Over the weekend I joined in the #RUNforBOSTON event at the White Mountain School. This event was organized by my friend Nate Snow, Assistant Head of School and Athletic Director at the White Mountain School. I was very happy to be able to join in the running of this event after being witness to the horrific events that unfolded at the Boston Marathon last week on a crisp blue sky day that should have been one of celebration. It was important to join together with some of my closest friends to run and remember and to be thankful for everything that we have in our lives. My Dad has reminded me that we cannot dwell on the “What ifs” from that day but be thankful for everything we have and to continue to support and love each other and help those who need it. I will continue to #RunForBoston and to Remember and I will continue to think about the courage of those affected by this tragedy. I hope that you will do the same. Be #BostonStrong!